Anyone can manage IT employees. Due to the fact that the employees have agreed to work for the company, as their manager you hold the ability to fire them in your hands. If they don't do what you tell them to do, you have the right to terminate them. That's management, not leadership. What can cool design firms teach IT managers? Leadership has to do with getting your IT team to WANT to do what you need them to do. When you are leading your team, when you are not around they continue to work towards the goals that you have established for the team because they believe in the goals and in you. Leadership is much more powerful than management. Leadership is also much harder to learn how to do. It has a great deal to do with understanding what motivates the members of your team and then finding ways to associate the team's goals with what each member of the team is trying to accomplish in both their career and in their personal life. Examples of how to be a better leader can be found in many different places. Not all of these examples come from within IT. 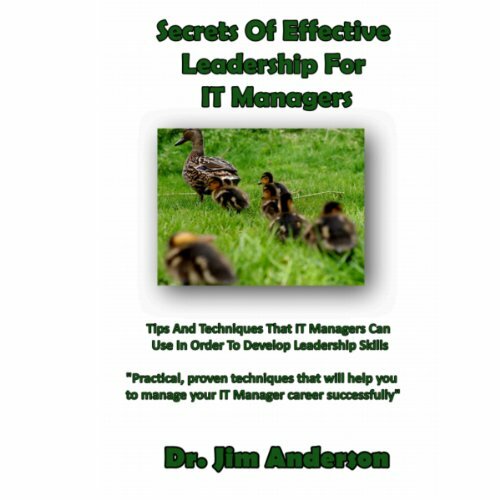 As an IT manager you need to learn how to keep your eyes open so that you can spot and learn from the good examples of leadership that are all around us each and every day. Understanding the various members of your team is a key part of knowing how best to lead them. This requires you to be socially intelligent and to have the ability to be "tuned in" to their needs. This audiobook will provide you with numerous examples of good leadership. I'll be showing you the skills and talents that IT leaders must have in order to do a good job of motivating their team. Creating a culture of leadership will allow your team to achieve more using the resources that are available to you. Very basic ideas that every one knows unbleached you are in your initial high school year. I will never buy any of his books again totally useless.